Retro Studios: "After Donkey Kong Country Returns We Had A Lot Of Gas Left In The Tank"
Nintendo finally announced Retro Studios' latest game during its E3 Nintendo Direct with the reveal of Donkey Kong Country: Tropical Freeze. As previously reported, the developer chose a Donkey Kong title over a Metroid one and many people have been wondering why this is. After Donkey Kong Country Returns we had a lot of gas left in the tank, there was a lot of cool things we wanted to do - the underwater levels, the 3D camera. We were just very excited about working with Donkey Kong and wanted to continue that and the Wii U hardware allowed us to do a lot of really new cool tricks. It seems like Retro Studios wanted to implement a lot of ideas not previously possible with the Wii game and the new Wii U hardware has allowed it to make these a reality. What are your thoughts on Retro Studios' choice? Let us know in the comment section. Gotta love Retro i think Retro are the RARE of today for Nintendo. Day One for me !! DKCTF all the way !! It might also be a once in a lifetime opportunity for them to work together with David Wise. This is sure to be a ton of fun even though it's announcement wasn't received as well as anything not-Donkey Kong would have been. That said, if they were working on another Nintendo franchise, I'd really it rather not be a Metroid one. They had a good run of three very solid Prime games, and it's time for them to reinvent another franchise in my opinion. Mach Rider, Takamaru, or perhaps even Star Fox since they're great with scifi. chose a Donkey Kong title over a Metroid one. One Donkey Kong sells more than Metroid, didn't Donkey Kong Country Returns alone sell more than Metroid Prime's whole trilogy. So Donkey Kong is more popular i for one am not disappoint, cannot wait for Donkey Kong Country: Tropical Freeze. I rather prefer this. Not a huge fan of Metroid (haven't played Corruption yet) and with this game Retro will get to know the Wii U hardware so their next project (Metroid or not) is gonna be really amazing. I was hoping for either another Metroid or even a Star Fox reboot, but all things considered I like the idea of another DKC game. I think a lot of the disappointment would have been nipped in the bud if they had revealed the game at last years E3. We've had 2 years of rabid speculation and many Nintendo fans assuming that whatever Retro was working on, it would show what the Wii U can really do from a graphical standpoint. DKC:TR will be a great game, the announcement was just a bit of a let down for those that let the hype get the best of them. Havent completed Donkey Kong Country Returns yet... have too many Wii and Wii U games to play.. Gotta take the time someday. I'm sure Retro wanted to make a new IP, but Ninty wanted to shove either Donkey Kong or Metroid down their throats. They had no choice but to choose one. Either another DK or another decade with Metroid. The choice was obvious. Mmmmm, Tropical Freeze is my favorite Kool-Aid flavour! Oh Yeah! Let me just state that the game does look good, and it looks fun. I'll probably buy a copy. Looking forward to Wise's music too. But I'm very underwhelmed. I'm not one of those people who were particularly looking for a new Metroid from Retro though. They have made three of them, and they do know Metroid better then Nintendo itself, but I wanted something new from them. StarFox, StarTropics, a new IP. I can imagine it gets stuffy feeling you're trapped as a one series developer. When Retro Studios stated "a project everyone wants us to do", I don't think anyone thought they meant another Donkey Kong game. Makes me wonder who constitutes "everyone" in that statement. Tropical Freeze would be the best ice cream flavor ever. @ThreadShadow "Everyone" as in everyone at Nintendo headquarters especially Iwata's big balloon head! 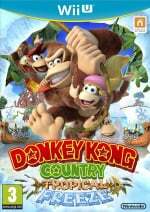 More like "After DKR, Nintendo told us to hurry our asses up and give them a WiiU game to hold people over for another month to make up for a complete lack of 3rd party support"
I can understand some disapointment for it not being something too too new, but hey, we are getting another Donkey Kong Country! I can't ask for much more than that! Any word on the difficulty? I know the 3DS has a "new mode" option w/ extra hearts and balloons and stuff. Any of that being used in this? And for those who don't like a game too easy, that's why it's an optional mode. I understand people complain about a game being too hard that they can't play it and don't get there money's worth, and I understand people complain a game is too easy that there isn't any challenge so what's the point of playing, but I don't understand why people complain when a game offers you an easy, normal and hard option at start-up. Sounds like a similar reason why Galaxy 2 was made - and that game is awesome - I'm sure this sequel will be great too! Puny surprise for me... I guess Metroid can wait. How about F-Zero or Star Fox; have those been completely forgotten? I would love a new F-Zero too but I didn't hold my hopes up for that just yet. I'll be purchasing this tho, maybe not day 1... maybe. Not quite sure yet but I can't allow this game to get away from me for so long like DKC:Returns did! Day one buy, no question about it. This is gonna be way awesome. @Banker-Style I couldn't agree more. 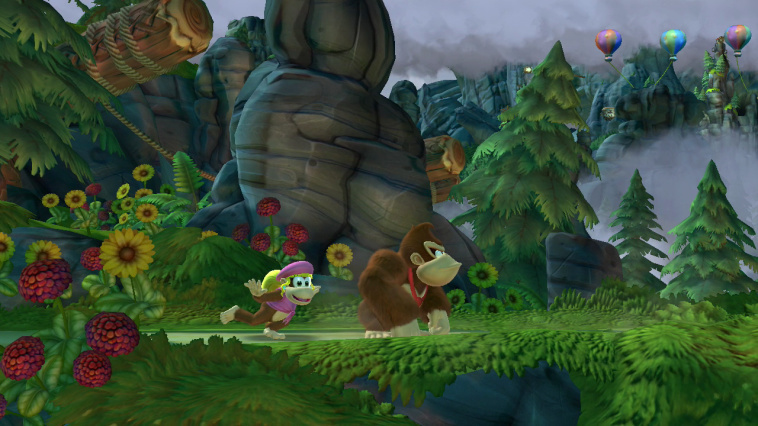 I think they made a pretty good choice by deciding to make a new Donkey Kong game. Also, it seems that they believe there is much room for improvement in this new entry in the Donkey Kong franchise so I look forward to seeing what they come up with. The game is looking great so far and with the addition of the composer of the original Donkey Kong Country games, this game could turn out to be pretty incredible. I understand the letdown but DKCR was an AMAZING game. I am really looking forward to this. DKC sells more than Metroid,I think it's for the best that leave Metroid or other games for later. And DKCR was great,this will be as well. Makes sense to me! Though I would have preferred a new Metroid game I will gladly take a new Donkey Kong game instead! A 2d platformer? It just seems like an easy game to make and were on overkill of those types of games. No matter how you look at it, this was a huge disappointment and I hope Retro can redeem themselves next e3. I was hoping they were working on a star fox game on EAD were working on F-Zero. Was really hyping myself up for a new F-Zero, it's been too long since GX. I think their decision to make another DK game is fine. But Nintendo must not forget it's other franchises. I really want to see a new metroid, 2D, 3D, I don't care about it. @Dev I think a lot of people didn't care what Retro did, assuming that whatever game they were making it wasn't just going to be this one. It could have been any type of game from any IP and I would have been happy. But this is literally the single option that was hugely disappointing, because it's just more of the same we've already seen. We wanted something new and exciting. Well I'm very happy with what they've shown in terms of the overall quality of it, the game genuinely looks brilliant, but I still wish they also had just one other game alongside Donkey Kong. If they'd somehow been working on say a new Metroid too, yes it's the obvious choice (maybe it could have been a new F-Zero or Star Fox), and even just had some footage of that other game alongside this game I think everyone would have left feeling fully satisfied and content with what Retro was bringing to the table. Right now because of the high standard of titles that Retro has been putting out, and the desperate need for more AAA games on Wii U in general, I just think we all want even more. Can't blame people for that really. I don't think it's a bad idea for a series that needs a sequel as much as other Retro titles. If I were to say something, it would be that other games like Starfox are currently in its perfect form, unless the team wants to add something more that makes it a more perfect entry to the franchise. Ok wait wait wait hold on, think about this: donkey kong was something they felt they should do. That's fine. However, this isn't the game they developed their new engine for. Obviously. Now with that being said, this doesn't mean they have started developing another game while finishing DK. They did just upscale. I'd still keep an eye on retro. I don't get it the games were harder in my early years.. Just keep playing.. That should be part of the fun right? Well it's good that there finally implementing underwater levels but I really hope they focus on the animal buddies this time too. If they bring back Winky the frog I'll shed manly tears. i guess there are more DK fans than metroid fans, but personally i'd much rather have a new metroid game, esp. since the DKCR remake just came out on 3DS. oh well. Considering DKCR outsold the entire Prime trilogy this decision is a no-brainer. I'm glad they aren't making a Metroid game because I'm still holding out hope for a 3DS sidescroller. We're about due for one- you 3D fans have been catered to enough. The WiiU did not need yet another 2D/3D JnR. There are way too many of these being announced lately. What the WiiU neded was something jaw dropping like Metroid Prime. I am not saything they should have made another Metroid Prime but something equally awesome. Right now there is only X that fits that category. If they wanted to make this game then we got the best game they could have done. Can't force creative momentum. Good for them doing it. @Dev also, it seem to remember alot of people asking for more DKC before, those people hiding out now? Lol. It really made sense for them to do another DKC, utilizing the assets from DKCR to save on development costs and cut on the production cycle (which I'm sure they are working on something else concurrently). It sells well, and is something that has not been tapped out as much as Mario has. It may be another 2D platformer, but if companies didn't do sequels in short succession, we wouldn't see improved titles such as DKC2 (which is still mostly regarded as the best entry). I loved DKCR, so I'm all for this (especially since the David Wise news). Plus as I've said before, this will give Retro more 2D experience to properly handle a 2D Metroid (which is long overdue more so than another Prime). There are plenty of 2d games for Wii U. I'm not excited about this. You know what would be neato torpedo? A multiplayer Metroid game using the gamepad. I could see one player as Samus (the wiimote and nunchuk) and another as a hunter (the gamepad), but not necessarily just in a co-op mode. They could also compete for whatever they are after (pirate bootie?) but the hunter would be hidden from Samus' view, akin to the multiplayer Pac Man idea on GameCube. The gamepad player could leave notes or traps for Samus and challenge her to duels or ask for aid. And the wiimote player could either avoid or interact (fight/assist) with the Hunter in order to gain some reward or incentive. I just hope that, when they (Retro, Nintendo, Team Ninja, other?) do bring Metroid to the Wii U, the gamepad won't be used solely as an expensive map screen. I didn't expect them to have another metroid game but another F-Zero game would be cool. Folks wanted Nintendos equivalent of a Titan Fall announcement or some big open world type game but what was made and and shown feels conservative to them. Have to agree with Thomas that this conservative-feeling line-up is what will sell best across the spectrum of buyers. if they work on something else once this is done, I am fine with it, I just hope they don't make this and then stop for a while. I hope they move to something we were all asking for after this. I think the name of the game is a little bit strange but it looks like a blast! I say they made a great decision - this title is hitting my Christmas list, and I'm hoping it'll be 2010 all over again; with a new title being a perfect throwback to the old. I think Nintendo was thinking the same thing. They went the safe road to try and get Wii U back on track. That said, I don't think I'm too disappointed. Would I have rather had Retro work on a new IP or Metroid? Yes. But does DK: DF look like a game I should be mad about in any way? Heck no! Plus, if people are looking for something to rival (or beat) games like Titan's Fall or FFXV need look no farther than X. Seriously, game looks amazing, and if you've played Xenoblade you'll know it'll play well too. Metroid Prime 3 was one of my favourite games on Wii. Donkey Kong Country was good, but doesn't last long in the memory. I think Retro are one of the most talented developers working today. Love what they did with Metroid and Donkey Kong, but I hope after Tropical Freeze here, they produce an awesome brand spanking new IP for the Wii U. They've done nothing but Metroid and DKC games since the company was formed. DKC 2 was a classic. The pinnacle of the original trilogy. I expect no less here. And given the option, I'd prefer DKC:TF this year with more time to flesh out and polish whatever else they're working on than either a less-polished epic this fall or somewhere down the road with nothing from Retro this year. Hypothetical, sure... But also potentially quite relevant. Meh Retro has been nintendo-ized and they have peaked then and there. Sure DKC will sell more than metroid, its a kiddie title in a kiddie console. Not to say it isnt a fun game thats well developed. Nintendo should have Retro with twice the staff pumping out both of these games. A 3 year turnaround for this and no HD metroid prime is highly disappointing for me as I would only buy wiiU if it had a metroid prime game. Donkey Kong is freaking awesome. I was thrilled by the announcement. Let's not forget that before DKCR, the DK series was essentially dead for a decade. One sequel is definitely not overkill. At least it's not another FPS Metroid. I had thought they were doing something original though. Well said my friend, a valid point to consider! Although, I wouldn't be surprised if the engine was consequently USED for this game since they had it lying around anyways, right? I also remember reading a story about Retro's website having posted hiring ads for 2 different programming positions- one with experience in cell shading and the other with experience in realism. Don't ask me for a source I don't have time to hunt it down. But Retro WAS hiring for different specialities, the question is does that mean they are in fact working on a second game with more "realism". Aren't there two different teams at Retro? Isn't it possible an "offload team" is designing another game while the "onloaded team" is working on Donkey Kong? This is a newish strategy that independent studios have found to be effective for keeping all of their workers active, without too much downtime or wasted efforts. Having all of your workers only focus on a single project at a time is often a recipe for preventable layoffs. Also, it's better this way, this team can practice by making Donkey Kong, then pull out all the stops with their next project. The best games always take longer than a year from console release to be produced. Don't forget, not all of the original Metroid Prime team is even at Retro anymore, so they wouldn't be able to make the same scope of game right now. New team members need to work together on relatively smaller projects before moving onto bigger ones. This is a pragmatic example of reality, a lot of Nintendo fans are asking for the impossible without realizing it right now. i definitely know whats its like to have a lot of gas myself. I would have prefered metroid, but tropical freeze still looks great. I think retro should do a beat em up, I think they would be good at that. DKCR was far from a kiddie title. It was quite a brutal game considering how hard it often was.